We cover the whole of the UK mainland and our group has processed over 12,000 applications under the Affordable Warmth Scheme. The Affordable Warmth Free Boiler Scheme is scheduled to run until March 2017 but there have been funding restrictions in the past and we advise householders who think that they may qualify to apply as soon as possible whilst funding is still available. you have an inefficient and faulty boiler. To qualify for the free boiler scheme you must live in a private house (social housing is excluded), receive certain state benefits and have an inefficient or faulty central heating boiler. From July 2016 we can also arrange to replace oil boilers or LPG boilers under the free boiler scheme. We do not offer full heating installations where you do not have central heating. This scheme deals purely with the replacement of central heating boilers for households which qualify. A. Receive State Pension Credit. B. Receive Child Tax Credit and have a household income below £16,010. D. Receive Working Tax Credit and have a household income below £16,010. Your existing central heating boiler or storage heaters must be faulty to be replaced under the Affordable Warmth. For this to be confirmed, a free technical survey must be carried out. Central heating boilers which were rated at C or below in the energy efficiency ratings will qualify for replacement if they are faulty. A and B rated central heating boilers will qualify for a boiler grant if they are faulty AND they would cost more to repair than to replace. Your existing electric storage heaters simply need to be faulty to qualify for a storage heater grant. When you apply for the free boiler scheme we will need to know the exact make and model of your existing gas boiler. We will check it against a database known as SEDBUK (Seasonal Efficiency of Domestic Boilers in the UK) and we will be able to tell you whether it should qualify. You can apply for the free boiler scheme by clicking HERE if you live in a private house (either owned or rented), you receive certain state benefits and you have an inefficient and faulty boiler. Although landlords of private properties can register their interest in the free boiler scheme for private properties in which they have tenants, the tenant is the applicant, not the landlord. Landlords should ensure that they have the tenant’s permission to pass their personal details to us before completing the application form. There is no limit to the number of properties which a landlord can have replacement boilers fitted in, as long as the tenant in the property at the time and the existing boiler meets the qualifying criteria. Where a tenant applies for the free boiler scheme, landlord’s consent is required before any installation can take place. Landlords who think that their tenant may qualify for the free boiler scheme should register their interest HERE. The Carbon Saving Community Obligation, shortened to CSCO, is designed to ensure that at least 15% of the funding provided by the six main energy companies goes towards installing energy efficient home improvements in the homes of low-income households in rural areas. The Carbon Emissions Saving Obligation, shortened to CERO, helps to fund difficult to install insulation measures which can’t be funded solely through the Green Deal initiative, such as solid wall insulation (which would almost certainly fail to meet the Green Deal’s ‘Golden Rule’ criteria). The Affordable Warmth Obligation is properly referred to as the Home Heating Cost Reduction Obligation, or HHCRO. HHCRO provides funding to cover the cost of installing certain heating and insulation products, such as a free boiler, into the private properties of low-income households. The Affordable Warmth free boiler scheme applies to homeowners and tenants who live in poorly heated and insulated homes and who receive certain state benefits. The Affordable Warmth free boiler scheme is targeted at low-income households, the elderly and the disabled. Although some installers choose not to replace back boilers because of the extra work involved, most of our installers do replace back boilers. Affordable Warmth free boiler scheme funding only normally applies to the replacement of boilers on a like for like basis, so if you have a combi boiler it will be replaced with a new combi boiler and if you have a system boiler (with a hot water tank) it will be replaced with a new system boiler. 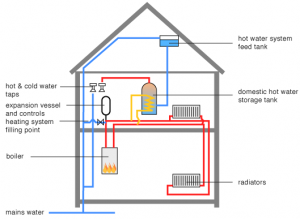 The only exceptions to this are back boilers and floor mounted boilers, which tend to be replaced with system boilers. However, your surveyor will be able to explain the situation based on your particular circumstances. A combi boiler, or combination boiler combines parts of a traditional central heating system which would otherwise need an external pump, a cold water tank and a separate hot water storage tank. Combi boilers provide heat for radiators whilst domestic hot water is supplied on demand. When a hot tap is turned on water is immediately taken from the mains supply and heated in the combi boiler before being made available at the hot tap. Combi boilers are the best-selling type of domestic central heating boiler in the UK but are only suitable for smaller properties where a family can manage without stored hot water in a hot water tank. Heat only boilers were used in most traditional domestic central heating systems in the UK prior to 1970. In addition to providing heat for radiators directly, they produce hot water which is then stored in a separate hot water cylinder, often in an airing cupboard. Cold water is supplied directly to the boiler by gravity from a cold water tank normally in the loft. Heat only boilers are more suitable than combi boilers for larger households where hot water may be required at more than one tap at a time. A system boiler works on a similar principle to a traditional heat only boiler but many of the major components such as the pump and expansion vessel are built within the boiler rather than being separate to it. It is therefore sometimes referred to as a sealed system. Many of the advantages of heat only boilers also apply to system boilers except that there is no need for a feed and expansion tank in your loft. System boilers can also be used with pressurised cylinders which means that you wouldn’t need a cold water tank. With a one pipe central heating system, one water flow pipe serves all of the radiators in sequence which results in a gradual reduction in the temperature of the hot water in the pipe as it travels around the house. The installation of a new ‘A’ rated condensing boiler into a property with a one pipe system will require new pipework to transform it into a two pipe system. The cost of this pipework is not normally covered by the Free Boiler Scheme. 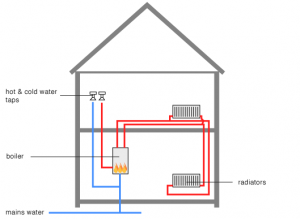 With a two pipe central heating system, the water heated by a boiler is fed to radiators through one pipe whilst cooler water returns from each radiator through a different pipe system. 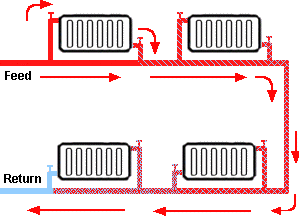 This means that a more even temperature can be created in all radiators with a two pipe system than with a one pipe system.